Fall is the best time for food. The smells of pumpkin, spices, apples and just heavenly. Especially when you add sweetness to these recipes. 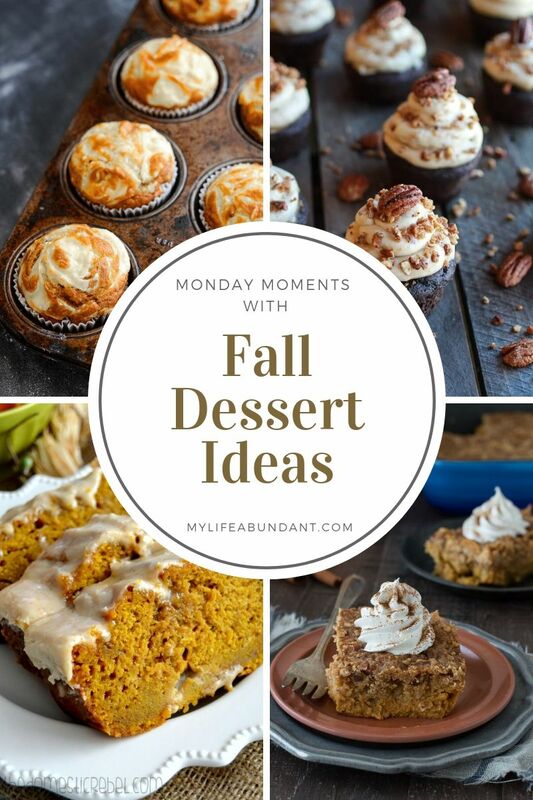 Enjoy a few fall dessert ideas I found for this season. I love making muffins and I will definitely add this Pumpkin Cream Cheese Swirl recipe to my list by The Novice Chef. Pumpkin and cream cheese sound so good together. And how about some yummy Chocolate Bourbon Pecan Pie cupcakes. OH MY!! Half Baked Harvest just blew me away with her recipe. Has some of my favorite flavors and an easy dessert to serve. I like bread, I like pumpkin and I like icing. Sooooo I think I will really like this Pumpkin Bread with Maple Icing by The Domestic Rebel. It looks so moist and would be great to serve with coffee in the morning too. I love dump cakes. All kinds and all flavors but I have never seen a Pumpkin Dum Cake recipe before. The First Year has a good recipe I think I might try and serve at Thanksgiving this year with a little ice cream on top. Yum.